Yeah, yeah, it's a little sad that the last post I had was the mid-year report. I've been silent for 6 months. I actually have several posts written, but never ended up posting them. Turns out that the final semester of college is pretty busy. Oh well. The good news is I have many posts cached that I can release every once in a while. My goal is to send one out every week. Anyways, on with the report! Turns out Strava does not tell you how much you rode and ran in a year. It will only tell you your mileage in the year your are in and the grand total. This year, I shall have to remember to check my final report before the calendar year ends. Nevertheless, the estimates I placed up there are close to accurate. I crossed the 1000 milestone sometime in early December and I had clocked 2300 miles or so before the winter months shut me down. These come shockingly close to my stated goals for the year. Go me! Alright! I'm two for two! I ground my way through a grueling 11:47:08 to finish well under my goal. Stay tuned for a full write-up on the experience. For now, suffice it to say that I am satisfied with my first time, and look forward to crushing it this year. Well, you can't win em all. I gave this one a real shot, but couldn't quite pull it off. I ran out of steam about halfway through the course, and coasted into the finish line at 3:20 or so. I gave sub 3 another try about a month later at the Irving Marathon, but couldn't make it due to poor nutrition. Maybe this year I can do it, but I'm by no means certain. I'll let you know how it goes come March. I never thought this day would come, but I actually do enjoy it now. I'm not as slow as I once was, and have started getting comfortable on the saddle. Actually, I wish I could do more riding than the weather currently permits, since my bike fitness has gone down the drain. Well... Maybe next year. Seriously spectators, I can't take the pictures by myself. This one isn't bad though, so It's not a total loss. Nevertheless, let us not forget the many accomplishments I've accrued over the year. 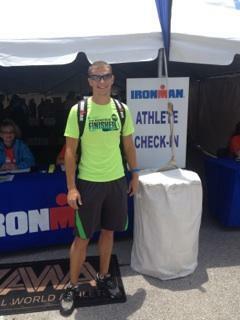 I finished my first Ironman, set new records for all of the distances I raced in, and even won a local half Ironman! So yeah, not a bad year. Texas showed me that I need much more volume to complete a full Ironman without running out of steam, I hope to spend the next few months gaining the stamina to finish an Ironman without walking. No, I don't have a big list like last year. Volume is a pretty all-encompassing goal. It means that I'll have to put in the hard, uncomfortable hours at inconvenient times. It means I'll need to actually do some swim training (unlike this year) and ride my bike in all weather. I'm going to try to drop to a better racing weight, but that should hopefully fall into place with the higher volume. Well, a long year stands ahead of me. I hope I'm ready for it! Success! Despite some knee trouble, I nailed it! My final time was 11:47:08, nearly 13 minutes under my goal. The splits ended up being completely different than I expected, but I still am very happy with the results. A full breakdown of the race is coming later. Failure. Turns out I wasn't as fast as I thought I was. I started off in the front of the pack, right with the sub-3s. Unfortunately, my body just conked out halfway through the race. I couldn't sustain the pace. Barring significant injury, I should nail this. As of July 1, Strava has my clocked at 697.3 miles. Considering I still have 6 months to go, It should be a cinch. Looks like I’m right on track. Again, as of July, Strava says I have ridden 1264.5 miles this year. I’ve been pretty lazy since the completion of my last two triathlons, so I need to step it up to make my goals. The reason why my numbers this year are so high is due to several 100 mile rides just before the ironman. I’m doing much better. Riding still isn’t as enjoyable as running to me, but I’m starting to get better. Now that I can sit more comfortably in the aero position and actually have a decent pace, I find myself having a better time. Hopefully things will continue to improve. At this point, I've completely forgone meals. I just eat something when I'm hungry. Theoretically, that's the healthy way to to it, so we'll see. The downside is I don't keep proper track of what I eat. However, I don't really have a problem with that, considering all I eat is squirrel food. As mentioned before, my dad is also participating in this challenge. He reports that he feels better, albeit in a nebulous kind of way. I cannot say the same. I feel no different from before. Which is crazy, because I believe I have cut my caloric intake by about 1500 calories per day. I still think that this "feeling better" thing is a crock. I guarantee that the time I am feeling at my peak is right in the middle of a bowl of ice cream. On the plus side, my food costs have plummeted. I eat very little, and what I do eat is pretty cheap. If I keep this up, my food costs will plummet. That's right, I'm back up to near where I started. It's got to be water, because I literally have drunk nothing else for 10 days, and I think all of the stuff that I ate today didn't weigh a pound combined. Ok, so I'm a week into the diet. So far, no real changes in training. Everything feels the same. I hoped that by this point I would be springing off the walls and running hundreds of miles, but no such luck. On the plus side, I'm pretty much on track for keeping my New Year goals so far. I'm at 39 miles running and 57 miles cycling, which is fine by me. I'm about due for some longer rides though. My biggest complaint last year was soreness and back pain while riding. After a little research, I've determined that there is essentially no cure. Oh well. My plan is to ride as many miles as I can and hope it goes away. The diet appears to be working. So far I'm 5 pounds down with 18 to go until I reach 170. Only time will tell whether or not it will improve my performance. It should though, especially for the run. There are almost no sub 3:00 marathoners over 200 pounds (about what I was at previous to the diet), so I have to do something right. Also, I've heard several people ask why my goal is 170-175 pounds. Basically, it's the BMI of the pros. Here's a good article explaining the relationship between BMI and performance. Anyways, nothing particular to report, other than Huntsville is really hilly. Hopefully I can keep up my training when school starts. Well, here we are at day 4 and I still haven't found myself being technically "hungry". I eat whenever I feel the need to eat (as prescribed in the rules),so I cannot complain about lack of food. Rather, I find myself painfully aware of any moment that I normally would have had an unhealthy snack. Any time I mosey on past the candy jar I feel a pang of reminder of things that are not to be. Any time I return from a run, my thoughts go to a time where I would make a pint of chocolate milk as a post-workout snack. Fact: there is no such thing as a healthy snack. There is only healthy food. You can eat healthy food during a non-meal time, but that does not make it a snack. Those who say otherwise haven't had a true snack in so long, they don't even remember what a snack is.Just because the health nuts chomp on their flax seed muffins and deem it a "tasty snack" does not make it so. On the other hand, maybe you need a little delusion to make it through the day. Maybe the only way to hold back tears after years of voluntary deprivation is to constantly say to yourself, "this chia seed pudding is just as good as the real thing". If so, soldier on brave souls, soldier on. Still no negative effect on training. Not really a positive one either, though. Well, something is definitely different. Even though I am full, I still suffer from terrible cravings. 8:00 or so is the worst time, most likely because that is when I normally have a bowl of ice cream or some other desert. I take the hunger and cravings as a sign that my body is getting used to the lack of sugar and dairy. Hopefully it will lead to some beneficial results. First, in the homeschooled community where I find myself, there are many claims as to the incredible health benefits of going sugar and dairy free. Even today at church when I discussed my diet with a homeschooling mom, her predicted benefits ranged from reduced mucus consumption to getting rid of that pesky "brain cloud". Yet even though many of the claims seem to be nebulous and unquantifiable, the sheer amount of them leads me to question whether they might just be on to something. Second, I am a well-known unhealthy eater. I drink chocolate milk by the pint and have eaten well over 5 pounds of candy since Christmas. Thus, it should come as no surprise that my Body Mass Index (BMI) consistently clocks in at an overweight 25 despite avidly training nearly every day. So really, barring anything else, just cutting out desert and candy will likely yield some great results. My hope is to approach the body mass indexes of the pro Ironman triathletes, who are somewhere between 20 and 23.5. 1. General Premise: The general promise of this diet is to, wherever possible, limit consumption of dairy and sugar. As such, all food and drinks with more than the tracest amounts of dairy and sugar are prohibited. Exceptions and specifics are included below. 2. Beverage Clause: Any beverages with sugar added such as soda and Gatorade are right out. Fruit juice and honey are not allowed in drinks. All drinks with any amount of dairy are banned. Water is strongly encouraged. 3. Fruit Clause: Raw, uncooked fruit is permissible. 4. Moderately Limited Substance Clause: 2 beers, 4 slices of bread (or buns), and one pasta meal per week are allowed. 5. Ingredient Clause: Recognizing that sugar and dairy are ingredients to commonly consumed and prepared food, reasonable allowances can be made to allow for minor amounts of banned substances in a group meal. Participants are encouraged to seek other options whenever possible. These exceptions only apply in group meals or when using the tracest amounts of banned ingredients. 6. Race Clause: If during the 30 day period either participant enters into a race that will last longer than one hour, he or she will be permitted to break any of the aforementioned rules, but only after crossing the start line and before crossing the finish line. 7. Conflict Resolution Clause: If either participant is unsure as to whether or not a certain food or drink is permissible. he must contact the other party for a ruling. If either party believes the food to be unapproved, it shall be so. I ran my first marathon in March, setting a benchmark time of 4:08:58. By the end of the year I was able to cut that time down by more than 40 minutes. I've progressed to a point in running that I don't really even feel like I'm running until about 5k into the race, which is interesting because the split pace for my first ever 5k and my most recent marathon are surprisingly similar. First things first, I bought a bike! It's worth noting that I've only had a bike since the start of June, and race my first Half Ironman with only 3 months of bike training. Since then, I clocked over 1100 miles on my Kestrel Talon, and have not yet learned to enjoy it at all. Hopefully next year I will actually be able to enjoy my rides. Until then, I can be satisfied with the fact that I finished the bike legs of my two Half Ironmans at around 18.5 MPH, despite them being my two longest rides all year. I learned to swim! Okay, not really, but I did learn how to breathe while swimming. Actually, I think I have a knack for it. In 4 short months, I progressed from not being able to swim 2 laps without stopping to setting a faster split pace than the winner of my first Half Ironman, which is particularly impressive considering he finished the race in 4:38:42, more than an hour and 15 minutes faster than my overall time. Unfortunately, this reinforces my belief that the swim portion of the triathlon is largely irrelevant to overall time. Oh well. I also learned that I cannot swim in a wetsuit. 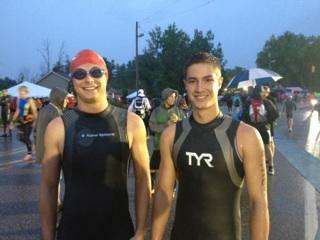 I almost did not complete my second Half Ironman due to seasickness and inability to move my arms during the swim. 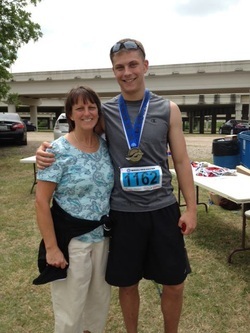 I am a Sam Houston State University student who has taken an interest in triathlons and marathoning.